Pink wanted a Christmas party, and roommate Tom and I are always down for parties so we all agreed we'd have one, but it couldn't be too serious. So, we opted for the Tacky Christmas Sweater party theme. Pink and I dressed in matching ridiculous outfits: holiday boxers, sweaters with bedazzled trees and pom-pom zippers, and pig tails with bells on them. We were the most tacky of the evening. A close second were the brunettes who rolled in looking like extra's from an 80's Christmas party. They took tacky sweaters they found and made them slutty using simple sewing techniques. For those that weren't tacky enough, our friend Kate brought decorations that stuck to the sweaters. This included letters - that lead to some very funny impromptu logo tees. I guess that's how the dance party broke out upstairs. It was either that or Gina playing Poison. All I know is, I ended up dancing to Madonna's Vogue. I did a routine I made up to the song and have been practicing in my room since I was about 14. People really seemed to enjoy it, or at least they said they did between laughing and dropped jaws. 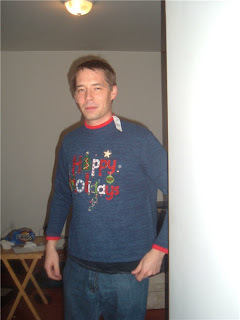 Thanks for reading my recap of my Tacky Sweater party.